Please Note: The screen shots used here are taken from the DVD portion of Chaplin's Mutual Comedies. Like The Beatles in 1964 or Michael Jackson in 1983, Chaplin's Mutual Comedies 1916-17 gives you Charlie Chaplin, Pop Culture Icon at the peak of his popularity. In these airy slapstick comedies, Chaplin is balletic, mischievous, quick-witted, and physically adept - yet having a subtlety and expressiveness lacking in his fellow silent clowns. Flicker Alley's spiffy two-Blu Ray, three-DVD set contains all twelve of the two-reel comedies Chaplin made at the Mutual studio in 1916-17, restored and presented with multiple soundtracks, copious annotations and documentaries on the little guy's enduring appeal. In its own way, Chaplin's Mutual Comedies 1916-17 traces Chaplin's own fascination with film as a storytelling art. Released over a period of sixteen months, one gets a clear sense of Chaplin transforming his famous Little Tramp from a simple excuse for slapstick humor into a nuanced, sympathetic character. Chaplin had introduced the baggy-trousered, bowler-hatted Little Tramp relatively recently (in 1914), finding that the character's scrappy determination resonated with movie audiences - especially immigrants recently arrived in America. Not surprisingly, most of the stories in the Mutual comedies involve Chaplin triumphing over buffoonish authority figures or stuffy rich folk - and usually winning the heart of a pretty maiden. 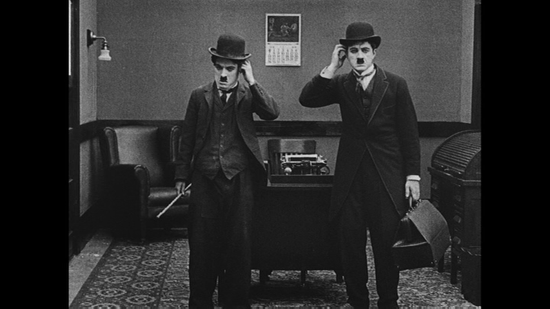 To the eyes of someone who thought of the brilliant but often sentimental Chaplin the least of the "big three" masters of silent comedy (along with Buster Keaton and Harold Lloyd), these shorts came as something of a revelation. The Mutual era finds Chaplin simultaneously doing effortless, balletic physical comedy while working out the very language of filmic storytelling. Remember, this was 1916 - American film was still the province of stiff, stagy melodramas and pie-in-the-face comedic trifles at this point. The fact that someone like Chaplin could be so massively popular while also being aware of his power to change this developing medium is astonishing to watch. 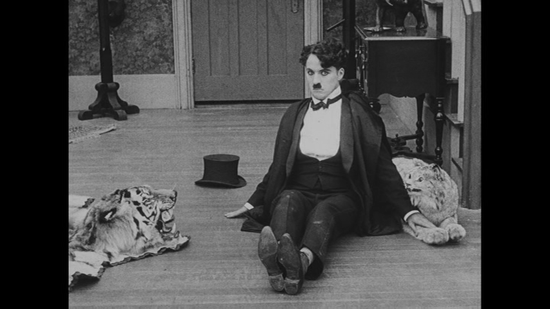 While his first Mutual, The Floorwalker, was characterized by routine, crude slapstick comedy, Chaplin had already learned to incorporate more substantial plots suffused with nuance and poignancy by the time of his third film there (The Vagabond). By the end of Chaplin's tenure at the studio (which had set up their own mini-unit, Lone Star, expressly for him), he had graduated from cinematic funny man to being a full-fledged auteur of sorts. It's no wonder Mutual had enough faith in the comic to make him among the highest-paid people in the world. Besides showcasing Chaplin's development as a filmmaker, the Mutual shorts are also just plain fun. Chaplin plays the Little Tramp here as the scrappy underdog who makes good despite constant misfortune, although there are a couple of examples where he steps slightly out of the role, such as a physically demanding turn as a besotted fellow simply trying to go to bed in One A.M. Chaplin also benefits from the use of a crack ensemble of supporting players in all these films, including Edna Purviance as his love interest and hulking Eric Campbell as the villain, along with Albert Austin, John Rand, Leo White and Henry Bergman. Running about 25-30 minutes each, these lively shorts would be excellent for introducing young children to the wonders of silent comedy. The Floorwalker (1916) - Chaplin gets into fever-pitched shenanigans at the department store, when some detectives confuse him for the store's cash-embezzling management. This film has a pretty rudimentary plot and typical use of slapstick gags, although there are a few memorable bits that make good use of Chaplin's graceful physicality. 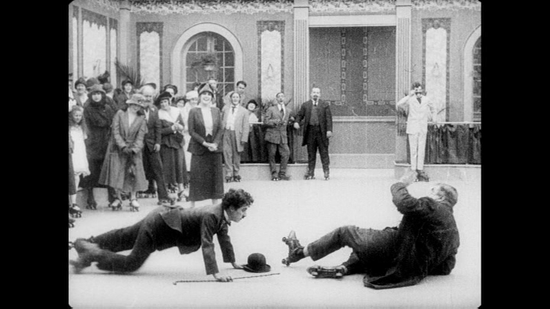 Highlights include Chaplin tussling with an escalator and doing a mirror-image routine with his character's lookalike (played by future director Lloyd Bacon). The Fireman (1916) - Another silly outing with Chaplin as an inept fireman who manages to save a young lady's life despite himself. This film is notable mostly for being shot at an actual Los Angeles fire station, with several interesting shots of the spread-out local neighborhoods. Chaplin also tries out a bit of camera trickery with a horse-drawn fire carriage shown galloping in reverse. The Vagabond (1916) - In a plot that foreshadows his later feature films, Chaplin's Little Tramp is a wanderer who comes across a kidnapped girl (Purviance) being kept as a laborer in a gypsy camp. Unlike the previous two films, The Vagabond incorporates physical comedy while also telling a subtle, dramatically intriguing story. One A.M. (1916) - Besides a brief appearance from actor Albert Austin as a taxi driver, this short is pure Chaplin as a swell attempting to navigate his own home while stinking drunk. Chaplin's impressive physical dexterity makes for several memorable moments, even if the comedy gets too repetitive. Since Chaplin found himself more comfortable interacting with others, this bit of solo slapstick counts as an odd detour. The Count (1916) - Playing to type, Chaplin crashes a swanky costume party and flirts with the prettier guests, much to the chagrin of his huffy boss (Campbell). Despite having nicer production values, the sluggish pacing in The Count makes it one of the lesser Mutuals. Chaplin does get to do some acrobatics on the dance floor, however. The Pawnshop (1916) - An evocative, cluttered pawn shop is the setting for this frenetic, multi-story short. Foreshadowing the classic shoe-eating scene from The Gold Rush, a cleverly done segment has the Little Tramp inspecting (and eventually destroying) a faulty alarm clock. This was Chaplin's first collaboration with longtime friend Henry Bergman, who acted in every one of his films for the next twenty years. Behind the Screen (1916) - At a bustling film studio, an aspiring actress (Purviance) disguises herself as a boy to be hired as a stage hand. In a scene used in the documentary The Celluloid Closet, burly boss Eric Campbell reacts to Chaplin kissing Purviance-in-drag with mock-effeminate gestures. Although some of the subtlety is lost, this chaotic story was set up to parody the kind of dumb slapstick Chaplin loathed while working for Mack Sennett (there's even a massive climactic pie fight). The Rink (1916) - While inept restaurant waiter Chaplin makes a nuisance of himself with his superiors and haughty customers, his clumsiness vanishes while impressing a pretty girl at the local skating rink. This particular short tends to amble all over the place, but it's generally lively and enjoyable. Images of Chaplin gracefully gliding on roller skates counts as some of his most indelible moments on film. 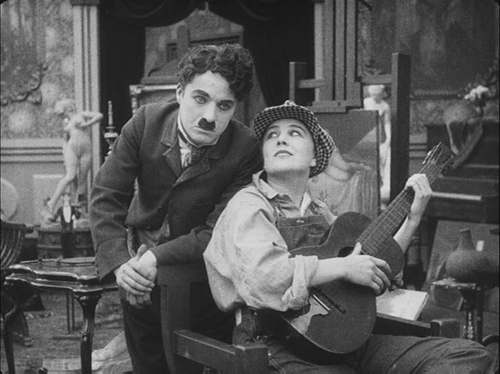 Easy Street (1917) - Although it was hinted at in The Vagabond, Chaplin's ambition of using comedy to tell a compelling, poignant story came to full fruition with Easy Street. Set mostly in a T-shaped section of an evocatively rendered urban slum, Chaplin plays a tramp who tries to redeem himself by becoming a police officer. While the film allowed for some impressive feats of physical comedy, Chaplin also included tender, expressive moments like the scene where he surreptitiously steals food to help out a starving waif. The mixture of belly laughs and evocative social commentary make Easy Street the highlight of this set. The Cure (1917) - Towards the end of his stay at Mutual, Chaplin was investing more time and effort into each production. It especially shows in The Cure, with Chaplin as a perpetually drunk resident at a lavish health spa. His character frantically trying to escape the hands of an aggressive masseur is the most memorable visual, although there are plenty of excellent gags involving a host of others. This frantic send-up of early 20th century health fads culminates with the spa's water supply getting spiked with wine. The Immigrant (1917) - Chaplin's generous "thank you" to the audience who found a kindred spirit in the Little Tramp, The Immigrant draws on the actor-director's own experiences in weaving an atmospheric tale of a downtrodden couple who bond on a ship bound for the U.S., part ways, then are reunited via a chance encounter. The shipboard scenes brim with Chaplin's versatility - a constant flow of clever gags, satirical jabs, a budding romance, innovative filmmaking techniques (a tiny room rocked by waves), and trenchant social commentary (the immigrants being herded like cattle). Not the masterpiece that many claim it to be (the repetitive, slapstick-reliant restaurant scene drags it down), but this one epitomizes Chaplin's melancholy-laced worldview really well - wrapped up in a beautiful ending. The Adventurer (1917) - The most frenetically paced, physically demanding of the Mutual shorts was the final one, with Chaplin as an escaped convict who saves a rich woman (Purviance) and her mother from drowning. Here, Chaplin gets in some good-natured ribbing at the expense of the stuffy rich folk, although one can sense a desire to move on to the challenges that feature-length films offered. Chaplin's Mutual Comedies 1916-17 comes packaged in a sturdy Steelbook snap-case with the five discs attached to hinged plastic partitions. The items in the inner front and back sections are somewhat hard to retrieve - those who want to access the Blu Ray content easily would be well-advised to move them to the center partitions. Although I would have preferred a digipack over the easily-scratched Steelbook, it's a handsomely done package with a striking red-and-black design that continues through the discs and accompanying booklet. All of the set's contents are duplicated on two Blu Rays and three DVDs. 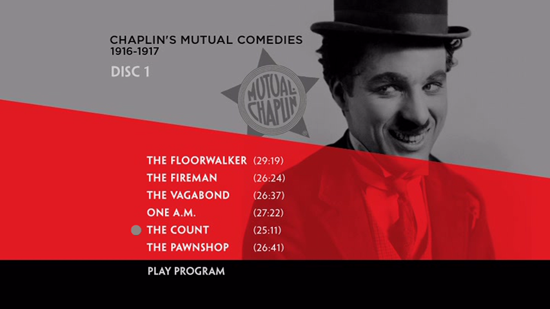 All of the films on Chaplin's Mutual Comedies 1916-17 underwent extensive digital restorations, the specifics of which are pointed out in text panels opening each selection. The bulk of the footage is sourced from original 35mm negatives, while a few missing scenes were supplied from nitrate prints. Although many of the films are heavily scratched, the care and detail in the restorations is apparent - the warpage and nitrate damage commonly seen in films of this vintage is virtually absent here. I should also note that all of the title cards are reconstructions, but they are done in the same style as the original Mutual productions. The Blu Ray gives these pictures a clarity and detail not seen in previous home video editions. On both the Blu Ray and DVD, the 1.33:1 image is presented pillarboxed in 16x9 anamorphic widescreen. Flicker Alley supplied two distinct, pristine-sounding stereo scores for each film - one using a small orchestra and the other with improvised piano. All but one of the 24 soundtracks are specifically done for this set, some from well-regarded composers like Robert Israel and Donald Sosin. A few films derive from original scores made for use by a Fotoplayer, a 1910s-era instrument that played prepared music and sound effects tracks using a piano roll. Two fascinating documentaries are included. Serge Bromberg and Eric Lange's The Birth of the Tramp (2013; 63 minutes) chronicles Chaplin's rise to stardom alongside cinema's development from nickelodeon distraction to an international industry. 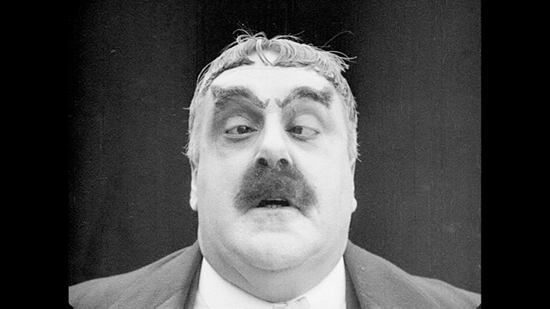 Kevin McDonald's little-seen Chaplin's Goliath (1996; 52 minutes) turns the spotlight on Eric Campbell, the burly actor who usually served as Chaplin's foil on the Mutual shorts. Additionally, a 28-page booklet provides background on Chaplin during this crucial period, along with comprehensive info on each film from historian Jeffrey Vance. With Chaplin's Mutual Comedies 1916-17, Flicker Alley presents a bounty of delightful silent comedies in tip-top shape. While I wouldn't say all twelve of these manic shorts are perfect, they do chronicle Charlie Chaplin's incredible growth as a filmmaker within a startlingly short time period. The expressive, poignant Little Tramp of The Kid, City Lights and Modern Times? It all started here. Highly Recommended.